Whether it’s government systems, industry secrets or your credit card information, cyber threats have never been greater. And with more of our everyday lives facilitated by networked computers, neither have the vulnerabilities. But with growing threats at home and internationally making the news more and more frequently, how is Canada responding to the cyber threatscape? 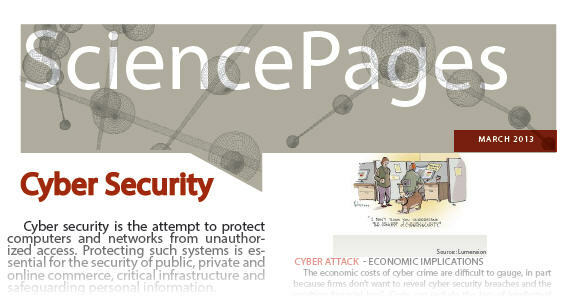 The March 2013 edition of Science Pages was prepared to brief Members of Parliament, Senators and public officials in Ottawa about the state of cyber security in Canada, today’s threats and those on the horizon and the importance of balancing security with personal privacy rights. I co-wrote this edition with Simon Liem and Carlton Davis for the Partnership Group for Science and Engineering (PAGSE) and the Science Media Centre of Canada.